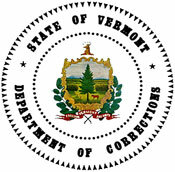 The Vermont Department of Corrections is an executive agency of the U.S. state of Vermont charged with overseeing correctional facilities, supervising probation and parolees, and serving in an advisory capacity in the prevention of crime and juvenile delinquency. It is a part of the Vermont Agency of Human Services. Currently the agency is headquartered in the White Cap Business Park in Williston. The agency was previously headquartered at the Waterbury State Office Complex in Waterbury. *In teamwork and the process of continuous improvement.